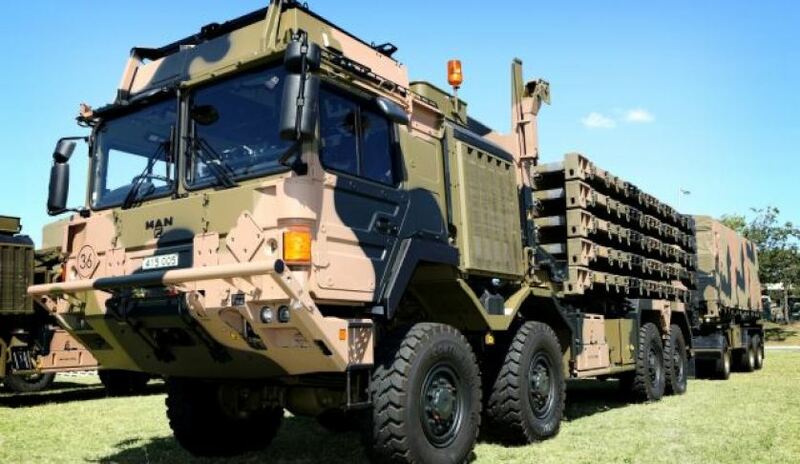 Minister for Defence Industry Christopher Pyne has announced that the Australian Defence Force’s land capabilities will be further enhanced with the purchase of 1,044 additional new-generation medium and heavy trucks, 872 modules and 812 trailers worth $1.4 billion from Rheinmetall. Minister Pyne said the additional medium and heavy trucks and their associated modules and trailers provided by Rheinmetall MAN Military Vehicles Australia (RMMVA) would facilitate logistics support through the movement of assets and supplies in combat, humanitarian, natural disaster relief and training. Highlighting the diverse roles these new vehicles will play, Minister Pyne said, "These modern trucks will be used for a broad range of military contingencies, from resupplying combat operations to supporting the ADF’s assistance to Australian and regional communities after natural disasters such as floods, fires and cyclones." While the trucks themselves will be manufactured on an existing production line in Austria, Australian industry will play a vital role in the project with RMMVA partnering with a range of Australia-based companies like Varley in Newcastle, Holmwood Highgate in Brisbane and ECLIPS in the ACT to supply the modules and trailers. “We’ve already got more than 1,000 of these trucks in service and they have proved their value, exceeding user expectations in disaster relief, training and on exercises," the minister said. Michael Wittlinger, the Head of the Rheinmetall’s Logistics Vehicles business unit and a member of the Rheinmetall MAN Military Vehicles Board, said "We are proud to continue our successful cooperation with the ADF. We will work with our network of Australian partners and suppliers to ensure the Australian Army can deploy these high mobility trucks, modules and trailers to military operations across Australia." This project marks the final government approval for the LAND 121 Program, which is replacing the ADF’s legacy fleet of ageing vehicles and trailers, many of which are in excess of 30 years old and becoming increasingly costly and difficult to maintain. Penske Commercial Vehicles (Wacol, Qld) – pre-delivery activities and spare parts supply. The trailers are being manufactured at Haulmark Trailers’ existing facility at Rocklea, Queensland. Haulmark has subcontracted Scientific Management Associates (Hawthorn, Victoria) to provide training and logistics support. Maintenance and through-life support for all vehicles, modules and trailers will be undertaken in Australia. LAND 121 Phase 5B will sustain over 100 jobs with Haulmark in Brisbane, as well as over 100 more with Rheinmetall, its subcontractors and supply chain across Australia. "Australian content is a critical part of the Project LAND 121 Phase 5B program, and will see the involvement of SMEs from across Queensland, NSW, South Australia and Victoria," Mr Van Lieshout said. The heavy trucks will replace the ADF’s Mack trucks and the medium trucks will replace its Unimog trucks. The Macks and Unimogs have been in service in the ADF since the early 1980s. The new vehicles will enhance performance and protection for the ADF’s training and logistic support capability by providing uniformity throughout the fleet. Around 40 per cent of vehicles delivered under Phase 3B will have protected (armoured) cabins to protect against ballistic and blast threats. Every truck will be fitted for military radios and the ADF’s Battle Management System as part of the Army’s move to a digitised capability. "Australian industry involvement is in the order of half a billion dollars for acquisition, with ongoing sustainment being carried out by Australian or Australia-based companies," Minister Pyne said.